The temperatures are heating up and it’s time to start thinking about spending time out by the pool. One of the best ways to take advantage of your pool this summer is to throw a pool party. If you’ve never held one before or you are looking to shake things up, there are a few secrets you should know. Read on to find out how you can throw an amazing pool party and keep your guests happy and wanting more. It’s tempting to invite everyone you know to come hang out at the pool. While you don’t want to leave anyone out, the pool is only big enough for a certain number of people before things start to feel crowded and the fun reduces. Therefore, it’s important to keep your guest list down to just a handful of people. The good news is you can always hold another pool party and invite another group of people over. In fact, inviting only certain people at a time can help mix things up and keep the parties entertaining for everyone. You may need to make some adjustments regarding how many people you can reasonably handle as the host. Remember, it’s critical to be able to give all of your guests some attention throughout the party. Music is the lifeblood of every party so it’s important to make your selections carefully to ensure everyone has a good time. While conversation is a critical part of a successful party, dead silence isn’t exactly conducive to the party atmosphere. Having some music going in the background gives everyone something to focus on when they aren’t actively involved in a conversation. Music can also have an impact on the overall environment at the party. Soft music can generate a relaxing atmosphere, while rock and other up-tempo music can create more of an energized feel to the party. Not sure what type of music to play? Talk to some of your guests and find out what they want to hear or ask them to bring their own contributions. What’s a party without the food? What type of food varies based on what you want from your party. If you’re holding a party around a meal time, you’ll need to provide something more substantial for your guests. However, if your party is in the middle of the afternoon or even during the evening hours, putting out some snacks can be all you need to do. Make sure you serve something easy to handle. Foods like chips and dip, pretzels and raw vegetables are great options for offering something to munch on while they sit around the edge of the pool. 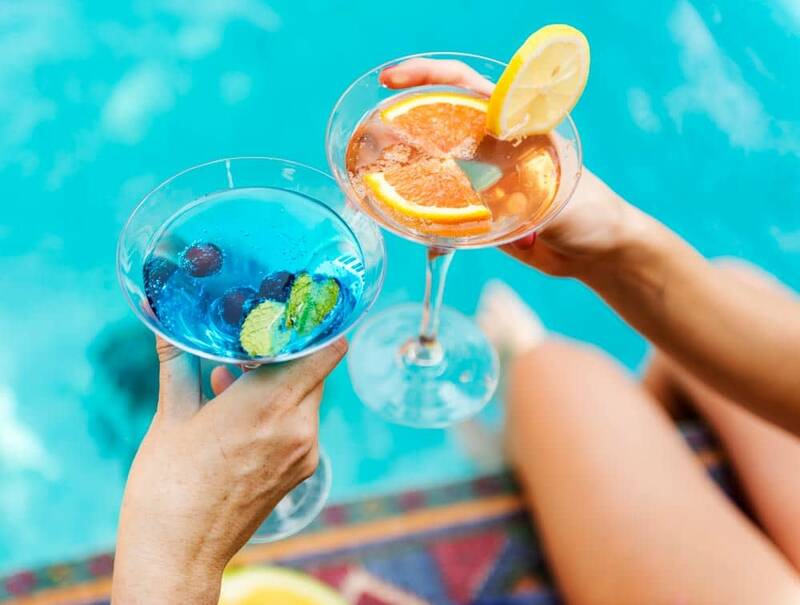 Even though your guests will be spending time in the water, it’s important to remember to serve drinks to your guests as well. However, even if your entire guest list consists of adults over the drinking age, remember that alcohol and pools don’t mix well. Water is always a great option. Include some flavored options if you want to mix things up. Consider setting up a full drink station as well that provides a variety of juices, sodas and other non-alcoholic drinks for everyone to enjoy as they relax by the pool. A cooler with ice can help keep these drinks cool and provide ice for your guests to put in their cups as well. Your guests will likely have their own sunscreen and other pool items, but there are individuals who may forget these elements as well. This means it’s important ot make sure you have all the supplies on hand, just in case you have a guest who may need them. This isn’t restricted to sunscreen alone. Another important item some of your guests may forget to bring on their own is towels. Make sure you have enough for everyone so if no one brings a towel, everyone has access to a fresh clean one of their own. This may create more laundry for you in the long run, but it’s well worth it to make sure your guests are comfortable and feel well-cared for. Throwing a pool party isn’t difficult, but it does take some additional forethought and planning other types of parties may not require. Although food and drinks is essential for any party situation, a pool party calls for a few extra touches, such as making sure you have the necessary supplies for your guests and have great music for them to enjoy while they’re hanging out. As long as you keep your guest list to a manageable level, you will find this type of party can be a lot of fun for everyone involved.